The head of the Financial Services Authority (FSA) has apparently privately warned UK banks to prepare for the imminent break up of the €urozone. Our glorious leaders (both at home and on the continent) are trying to scare us into thinking that the collapse of the €uro and/or the EU would destroy our economy but they aren't being entirely truthful. It would be ridiculous to suggest that our economy would be unaffected by the collapse of the €uro but our banks aren't massively exposed to €urozone bonds and the UK taxpayer isn't massively exposed either. 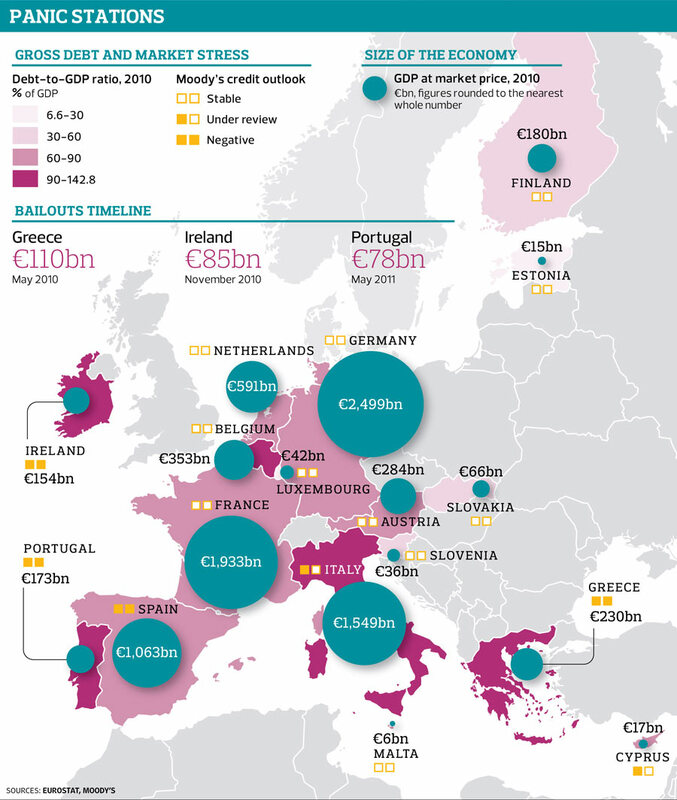 The amount of money the taxpayer and the banks have invested in the €urozone certainly isn't trivial but it's not fatal. It is important that we distance ourselves from the €urozone and the EU to avoid getting dragged down in the €uro's collapse. We aren't so tightly integrated economically as most of the EU, we need to emphasise our distance from the reckless economic policies being dreamed up by clueless imbeciles to try and save the terminally ill single currency (or "the euro-vantity project" as Nigel Farage calls it!). The EU's Commissioner for Economic and Monetary Affairs, Olli Rehn, has already said that EU leaders have 10 days to save the currency. For the sake of the 317m people afflicted with this mickey mouse currency and the untold damage it's done to their national economies, I hope he's right. Once the €uro has collapsed we will see interest rates dropping and national currencies reintroduced way below the €uro's artificially strong present value. The question people in countries like Greece, Ireland and Portugal will be asking then is if that is what was needed to get them out of the mire that €urozone membership has got them into, why didn't their leaders do it sooner?